I have a problem. I have both no desire to spend ages faffing around with my hair in the morning and I also have the wild kind of hair that requires a lot of effort to look good. Freshly brushed and un-styled, I look like a cross between Monica from Friends and Hermione. This is obviously not OK. So I have some products that I happily smooth all over my hair every time I wash it, and some tools I always use because even I can use them. Yeah, really good names. Basically with this I straighten my hair quickly – I’m not too precious about it, and don’t bother sectioning it into 50 parts. I have one big clip, and normally do the left, the right and the top. Scientific, like. 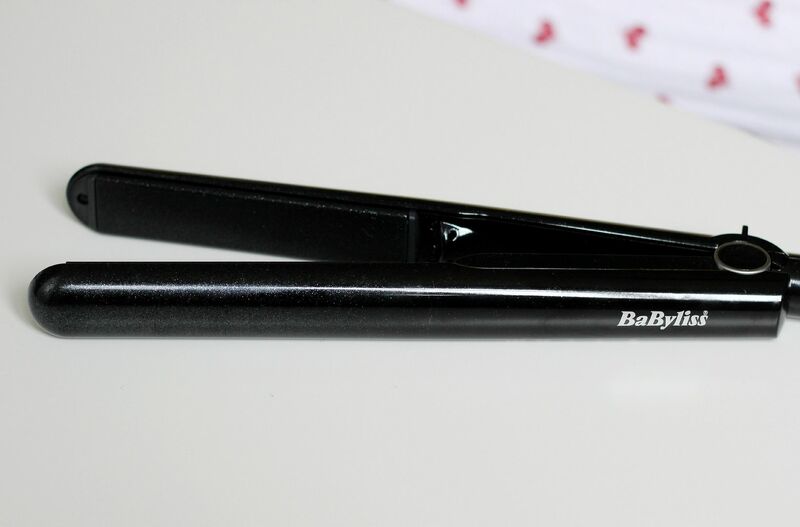 I was sent these Babyliss Diamond straighteners, from Debenhams, and have been really enjoying them. They heat up so fast, in about 5 seconds, which I am loving because y’know… convenient. They make my hair all silky, and are just as good as my GHDs. When my hair’s all straight and soft, I normally run some of the Aveda Brilliant finishing gloss through the ends to make it less frizzy. Then I just grab a section on the side, and plait it/clip it in place. So easy. My top tip would be to lay the hair down as a test before you start plaiting, to make sure it lies in the right way and doesn’t stick up in an annoying way. 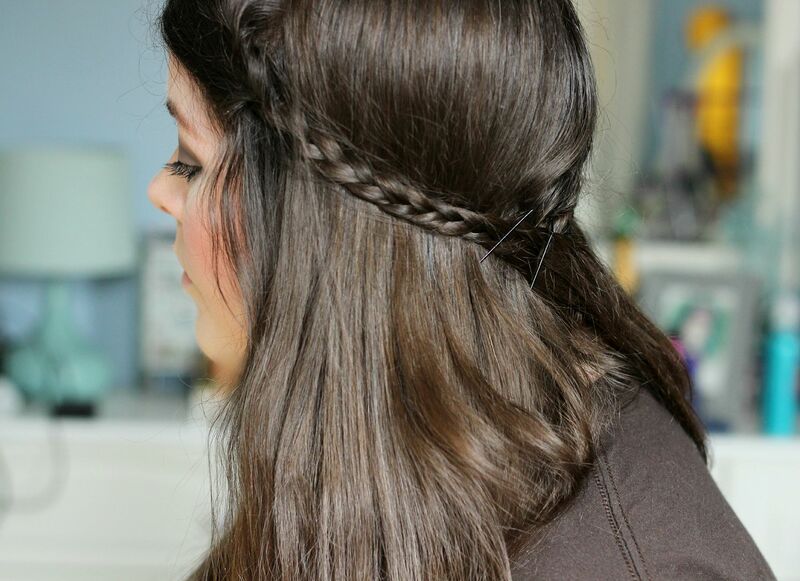 Ok, so if the plait one was easy, this one is pathetically easy. I normally do this one on two/three day hair because it needs a little more grit. I straighten (repeat the process from the plait style & add liberal amounts of serum) and then scrunch a medium amount of hair up into a half bun thing. It doesn’t need any clips – just a small hair band. I then add an equally liberal amount of hair spray (you’ve used enough when you can taste it) and scrunch the roots a bit to give it some volume. Nothing groundbreaking, clearly. When I have my hair like this I normally don’t look so grumpy and over-exposed, hehe. 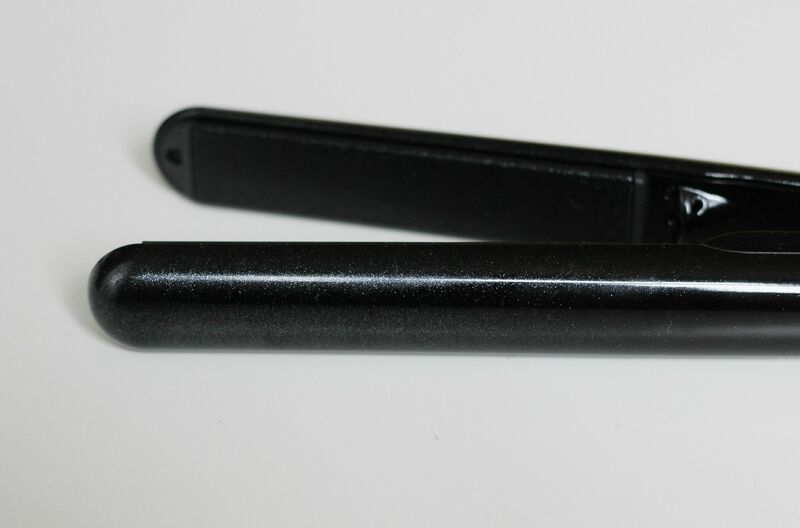 With this one I use my enrapture curling wand. I got it for the bargainous price of £17 a few years ago, and it is perfect for making curls. 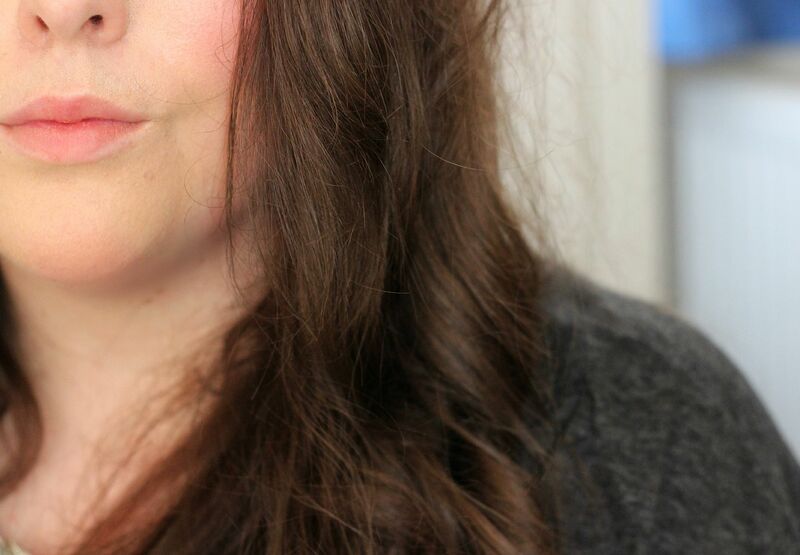 I use it on the highest setting because my hair is thick and has a mind of its own – I just again section my hair into three bits (right, left and top), and then section those bits into roughly 6 different mini sections. Curling away, I don’t mind about whether it’s anti-clockwise or not… apart from the hair nearest the face. That should always be curled away from the face, because it looks so much more natural and won’t make you look like a Victorian doll. Whilst I’m chatting all things hair, I thought I’d mention some products that are a god send if you have thick, wavy and frizzy hair too. This brush from beauty bay (best £2.50 ever) makes brushing my hair so easy, like ridiculously so. 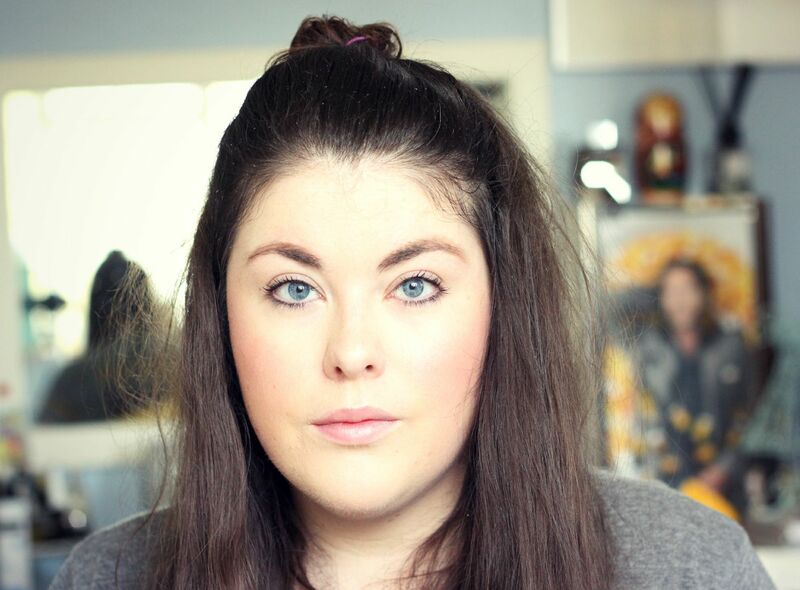 The Boots curl creme (recommend by Sali Hughes) is so pink, cheap and amazing. I slap some on my damp hair, and it makes such a difference to how smooth my hair is. 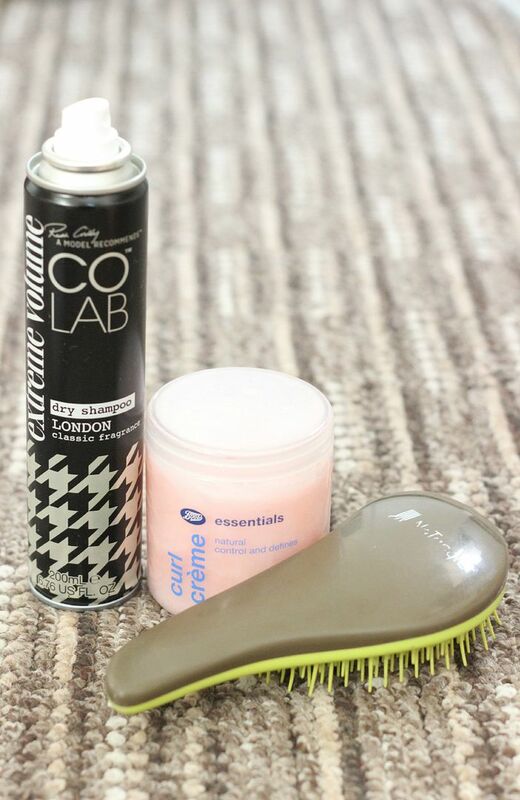 The colab dry shampoo (extreme volume version only) gives my roots some action and smells like perfume. Not pictured, because I moved and have lost (why) them – the Aveda brilliant finishing gloss, Simon & Tom moroccan oil and Dove leave-in conditioner. What are your go to hairstyles?